The study looks at definitive proxy statements filed by S&P 500 companies. This is only a summary of the full 2015 Study of Executive Severance Arrangements Not Related to Change in Control. To obtain the full report, please contact Donald Kalfen. Meridian Compensation Partners, LLC 2015 Study of Executive Severance Arrangements (“Study”) provides current information and data on severance practices, not in the context of a change in control (CIC), at large U.S. public companies. 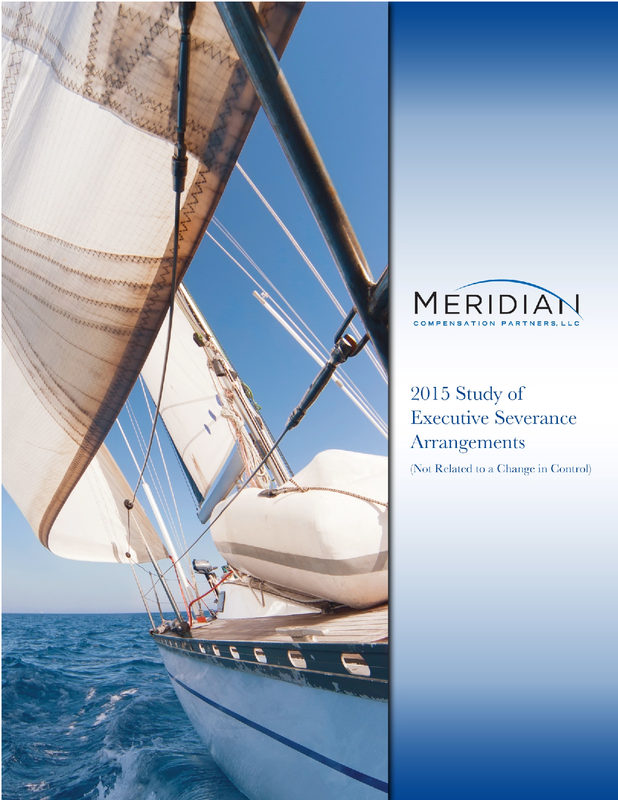 For information on severance benefits payable in the context of a change in control, please refer to or request a copy of Meridian Compensation Partners 2014 Study of Executive Change-in-Control Arrangements. Data for fiscal 2014 executive severance arrangements is derived primarily from 2015 definitive proxy statements filed by 160 major public companies (the “Study Group”). The companies in the Study Group represent a cross-section of the Standard & Poor’s 500® Index (S&P 500®). As such, we believe the results of the Study fairly represent executive severance practices among S&P 500 companies generally. Revenue and market capitalization statistics for the Study Group are displayed below. Vesting and settlement of long-term incentive awards. The Study also provides prevalence data on the types of terminations of employment that trigger one or more of the foregoing severance benefits. However, the Study does not take into account benefits that may be payable to an NEO upon death, disability or retirement or capture potential enhancements that may be negotiated upon actual termination. When meaningful, the Study shows separate prevalence statistics for the CEO and the other NEOs. Prevalence statistics shown for the entire NEO group or a subset of the NEO group represent an approximate average of the group’s statistics. Unless otherwise indicated, statistics presented in this Study are based on the number of companies in the Study Group that maintain executive severance arrangements providing for the payment of cash severance benefits upon a qualifying termination of employment. Study Group companies that do not maintain executive severance arrangements may nonetheless negotiate, on an ad hoc basis, a severance package for a departing executive. The range of severance benefits provided under ad hoc severance packages varies widely. The statistics developed under this Study do not take into account the prevalence of such severance packages or their terms. Executive severance arrangements refer to any arrangement that provides benefits to an NEO upon a qualifying termination of employment that is not in connection with or contingent upon a change in control. to avoid individual negotiations, with possible resulting disparate treatment of terminating executives. Executive severance arrangements typically take the form of either: (i) an executive severance plan or policy covering executives by name or by group (the current trend); or (ii) an individual employment contract or severance agreement. However, executives may be eligible to receive severance benefits solely under a broad-based severance plan. Separately, a company’s equity incentive plan or applicable award agreements may provide special treatment of outstanding equity awards upon certain termination of employment events. Generally, executive severance benefits are triggered upon an executive’s termination of employment without “cause.” Substantially less often, executive severance benefits may be triggered upon an NEO’s voluntary termination of employment for “good reason.” The lower prevalence of good reason triggers is due to companies and Boards needing to retain flexibility to modify compensation and benefits, and altering reporting relationships and job content over time, without triggering the payment of severance benefits. The most common executive severance benefits provided to NEOs are listed below. Vesting and settlement of long-term incentive compensation. Often the payment of severance benefits is subject to restrictive covenants, execution of a release and waiver of claims or both. Common restrictive covenants include non-compete, non-solicitation, non-disclosure and non-disparagement provisions. Releases and waivers typically prohibit a departing executive from bringing a lawsuit against the former employer for employment-related causes of actions, including actions under the Age Discrimination in Employment Act. The prevalence of executive severance arrangements and their principal terms and conditions have remained fairly constant since our 2012 Study with one notable exception. As described in more detail below, cash severance multiples for CEOs and other NEOs have been trending down since 2012. We expect this trend to continue for the near and mid-term. The Study’s key findings are summarized below. The payment of cash severance (and certain other related benefits) to NEOs upon a qualifying termination remains a widespread practice among the Study Group. In 2014, 69% of the Study Group maintains severance arrangements that provide cash severance protection for NEOs, up slightly from 67% in 2011. Thirty-one percent (31%) of the Study Group did not disclose whether NEOs are covered under a severance arrangement. For these companies, NEOs could be covered under broad-based general severance arrangements. However, the proxy rules do not require disclosure of such arrangements. Therefore, the percentage of the Study Group that provides cash severance protection to NEOs may be greater than 69% due to the non-disclosure of severance protection provided to NEOs under broad-based severance arrangements. The payment of cash severance is always triggered upon an involuntary termination without “cause” while it is half as likely to be triggered upon a voluntary termination for “good reason.” The definitions of cause and good reason vary widely among Study Group companies that maintain severance arrangements. Cash severance multiples have markedly declined since 2011 at those Study Group companies that base cash severance exclusively on a fixed multiple of compensation. For CEOs, 3× cash severance multiple declined in favor of 2× cash severance multiple, with 2× becoming the majority practice (61% of companies up from 48% in 2011). For other NEOs, the prevalence of 2× and 1.5× cash severance multiples declined in favor of 1× severance multiple (37% of companies up from 30% in 2011). The most prevalent definition of compensation is the sum of base salary and target bonus. In addition to cash severance, severance arrangements often provide to NEOs other benefits (not considering those related to long-term incentive awards). The most common of these benefits are current (stub) year bonus, health care continuation and outplacement services. Like cash severance, these additional benefits are paid upon the occurrence of a qualifying termination. Typically, a current (stub) year bonus would be paid pro rata based on actual performance through the end of the applicable performance period. Treatment of long-term incentive awards upon a qualifying termination varies by type of award. Stock options and performance cash awards are somewhat more likely to be forfeited, while restricted stock/restricted stock units (RSUs) and performance shares are somewhat more likely to vest in whole or in part. The charts below show the prevalence of these practices among all Study Group companies. In cases where performance share and performance cash awards vest upon a qualifying termination, nearly three-quarters of companies determine the value of such awards based on actual performance through the entire performance period (virtually unchanged from 2011). Subjecting the payment of cash severance benefits to the execution of a release and waiver of claims agreement and including one or more restrictive covenants in severance arrangements are both increasing in prevalence. Release and waiver of claims. Approximately 67% of companies condition the payment of cash severance benefits (and other severance benefits paid under the same arrangement) upon the timely execution of a release and waiver of claims agreement. Restrictive covenants. Approximately 74% of companies include one or more restrictive covenants in their executive severance arrangements. The most prevalent restrictive covenants are non-solicitation of employees, non-disclosure and non-compete. Available at www.meridiancp.com or by emailing Donald Kalfen at dkalfen@meridiancp.com. The Standard & Poor’s 500® index is a registered trademark of Standard & Poor’s Financial Services, LLC, a wholly owned subsidiary of The McGraw-Hill Companies. Unless otherwise indicated, statistics presented in Key Findings are based on the population of the Study Group companies that maintain cash severance arrangements.